The artists who create natural history graphics and exhibits learn all they can about their subjects so that their work is accurate. Pretend you are an artist for the Arizona-Sonora Desert Museum and you are asked to work on a Desert Museum exhibit. Select an animal or plant you want to learn more about. Research your subject by reading books, using the internet, or visiting the Desert Museum. Choose one or more of the art projects shown below. 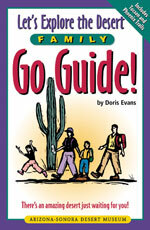 The Desert Museum is publishing a series of children's book and gives you the assignment of writing a story. Here are the details. You must pretend YOU are an animal and write a story about your life. Here are some of the things you could include.